New QueryNode with given id and weight. New QueryNode with default id (0) and weight (1). New QueryNode with given weight and default id (0). the weight of this node. Copy the DocInfoList for a given node. update doc list from children's doc lists. evaluate the node on the given document, returning a score. Does this node have a proxList? Iteration through a node's prox lists. Any entries left in the list? advance to next element in list. return false if empty. the next document this node matched. flatten children of a node into weighted prox entries. Union the DocInfoLists of a given node. Intersect the DocInfoLists of a given node. Number of children in ch. Base class for all structured query operators. A query node is assumed to have a list of children, an id, a weight (default 1) and an eval function which will be defined by its subclasses. Implemented in lemur::retrieval::ProxNode, lemur::retrieval::SumQnode, lemur::retrieval::WsumQnode, lemur::retrieval::AndQnode, lemur::retrieval::OrQnode, lemur::retrieval::NotQnode, lemur::retrieval::MaxQnode, lemur::retrieval::BandQnode, lemur::retrieval::BandNotQnode, lemur::retrieval::FiltRejQnode, lemur::retrieval::FiltReqQnode, lemur::retrieval::TermQnode, and lemur::retrieval::PassageQNode. this should iterate over the sets of prox lists pairwise intersect (or clever). advance to element with id did, or to next element beyond if did is not found. Return true if found, false if not. flatten children of a node into weighted proximity entries. removes all belief operators. 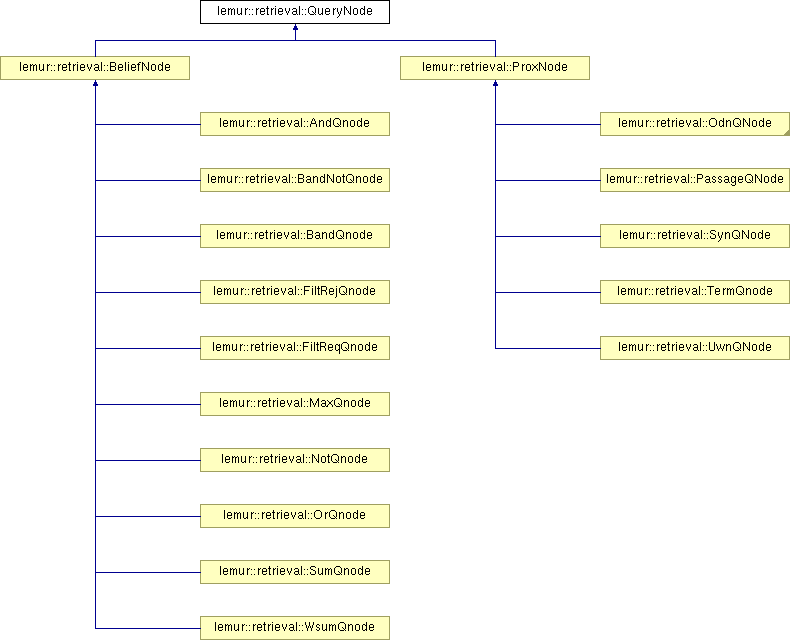 Implemented in lemur::retrieval::BeliefNode, lemur::retrieval::ProxNode, lemur::retrieval::BandQnode, lemur::retrieval::FiltReqQnode, lemur::retrieval::OdnQNode, lemur::retrieval::UwnQNode, lemur::retrieval::PassageQNode, and lemur::retrieval::SynQNode.